Life is easy if you have domain joined computers. They get policies, they get your SOE and they get told when their password is about to expire (or has expired). When you have a BYOD solution, this can become difficult. 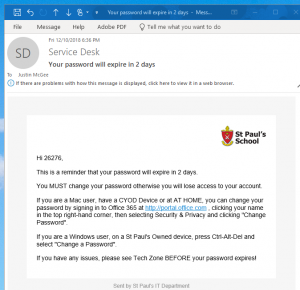 Sure, you can provide a password reset utility for users to use (such as Azure AD Connect Password Write-back through Office 365), but it’s not guaranteed users will remember where it lives, even if you make it as obvious as a big red button on the Intranet page. to users when their password is about to expire. It’s super simple, and works great! I’ve attached the script and HTML template here – grab them, re-jig as you need to, setup a scheduled task and off you go… it works a treat! I spend a lot of time putting together AWS Cost Calculators, and as it’s been a while since I’ve made a post, I thought I’d show off a neat little extension for Chrome that I put together. The AWS Simple Cost Calculator – https://calculator.s3.amazonaws.com/index.html – is a great tool for putting together the cost of AWS Resources. Probably the biggest use of these would be for putting together EC2 Instances and EBS Volumes. For the AWS Uninitiated, these are the equivalent of a Virtual Machine and associated disks.